Bob Sanderson has been the resident PGA Golf Professional at Widow’s Walk Golf Course in Scituate, Massachusetts since the course first opened in 1997, bringing to the newly created position an impressive background as a golf course manager and teaching professional. A veteran with over 35 years of professional experience, Sanderson began his golf career in 1979, as the assistant professional at the Crestview Country Club in Agawam, Mass. That winter he moved to a similar position at the Grenelefe Golf & Racquet Club in Haines City, Florida, where he served until 1980. 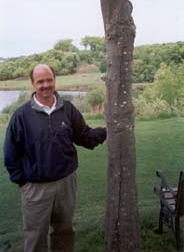 His First assignment as a head golf professional and general manager came at the Crumpin-Fox Club in Bernardston, Mass., in 1980, a position he held until 1987, when he moved to The International in Bolton, Mass., and served as the head golf professional and the golf director for the next eight years. Bob has also logged numerous hours as a teaching professional, including a summer of work at the Golf School at Stow Acres in Stow, Mass., where he taught students of all ages and ability levels.